With solar power growing in popularity, manufacturers and scientists have widened the range of its applications. One application of solar power that has really taken off is portable solar panels. These guys work the same as regular solar panels that you might have on your roof, but in miniature. They can charge a number of small to medium sized electronic devices and most have a huge capacity. Even more, many of them can fit in your pocket or backpack. We've looked at the top-rated chargers and picked our top 10 best portable solar panels. With these, you never have to worry about your phone or laptop dying ever again. Plus, you can rest assured that you are fighting the good fight by using clean, renewable energy. In the chart below, you will find our top 10 rated Best Portable Solar Panels. For a more in-depth review of each model, please click on "Read Review." 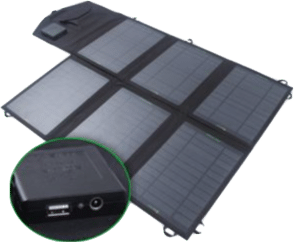 What Are Portable Solar Panels? The best portable solar panels will work exactly the same as regular solar panels. The only difference is that the size of the device they can power and the capacity of the solar cell and battery. Though limited compared to large-scale solar panels, portable solar panels come in a variety of sizes and capacities. The ones we are featuring are the smaller variations, meant for charging cell phones and other electronics. However, they also have portable solar panels that can act as backup batteries for your house or used as power sources for an RV. Even though they are portable, they are still pretty big systems. There are three types of solar panels, which are monocrystalline, polycrystalline, and thin film. Each has their own advantages and disadvantages, as well as specific efficiency. Which one is better? What is the best solar panel to buy? Before we jump into the different types of solar panels, it is important to know what makes them up. Almost 90 percent of the world’s photovoltaic panels today are based on some variation of silicon. In 2011, nearly 95 percent of all shipments by manufacturers of the United States to the residential areas were crystalline silicon solar panels. Now, the main difference between the solar panels is the purity of the silicon. Basically, the more perfectly aligned the silicon molecules are, the better the cell will be at converting solar energy. The efficiency of the solar panels goes right along with the purity of the silicon. However, the process used to enhance the purity is expensive. Therefore, efficiency shouldn’t be your main concern. It mostly comes down to the space available. Portable solar panels are something probably not a lot of people are very educated on. That being said, it can get a bit confusing when shopping for the best portable solar panel. All of the different features and accessories that are available can be a bit overwhelming. In order to help you out, here are some things that you should be on the lookout for while you are shopping. 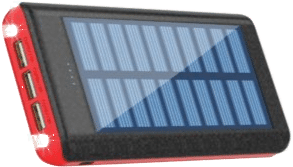 Having a USB port is kind of a necessity when using a portable solar panel, especially if you plan on using it to charge your smartphone on the go. In fact, most portable electronic devices are charged exclusively by USB. Nearly every cell phone and tablet are nowadays. 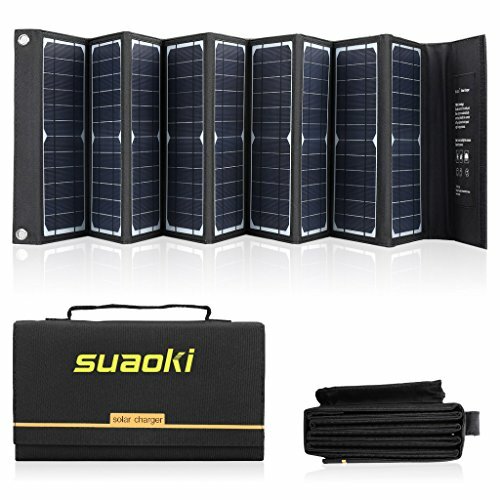 In summary, having a USB port (or multiple USB ports) is a defining quality in the best portable solar panel. Also, having a high amp USB port is a good idea if you want to take advantage of the quick charge that a lot of the newer smartphones have. This may seem like a given, but there are many brands that do not have this feature. Some are purely the solar panel and that is it. There is no way to use it as an actual power bank. It forces you to charge your device purely from the panel. The addition of an integrated battery allows for pre-charging. 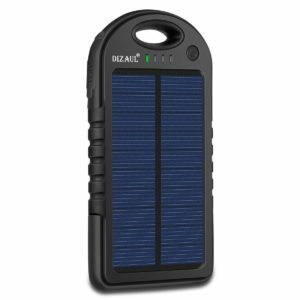 You can leave your solar charger out and let the battery pack charge up. Then you can take it with you and plug in whenever you need a fresh charge. 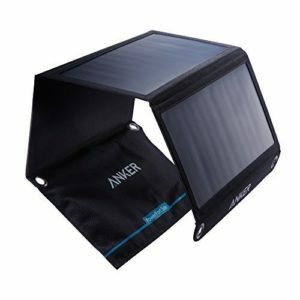 Many of the best portable solar panels have this feature as it allows for greater versatility. However, one slight downside to the integrated battery is that it will not be as efficient as direct solar charging. Thankfully, the difference is not that bad. They are only about 75 to 80 percent as efficient as the actual solar panel. The whole point of these portable solar chargers is convenience. When that is lost, they become more of a hassle than something useful. Some brands of panels will stop charging when a cloud passes or becomes shaded and will not restart without you unplugging and plugging it in again. This can become a serious annoyance. The best portable solar panels will have what the industry calls "auto-restart technology". This means that all you have to do is open the panel, plug in your device or switch to charge the battery pack. It will continue to charge the device until you take it out and restart itself as soon as access to sunlight is restored. Be on the lookout for complex setups, excessive adapters and cords, and anything else that may seem unnecessary. Anything portable should mean lightweight. 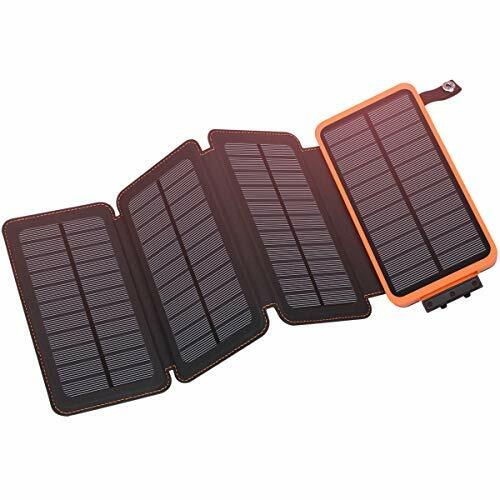 If you are taking this solar panel backpacking, hiking, or traveling in general, you do not want to add any more weight than is necessary. Unfortunately, when looking at photos of these portable solar panels, it is hard to gauge the weight of them. 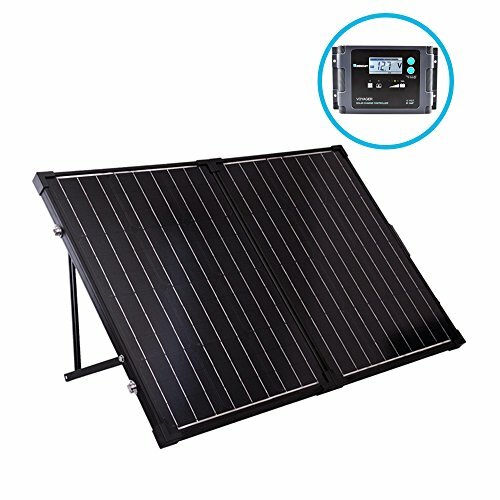 In addition, when checking the weight claims by the manufacturer, be sure that the weight includes anything that is included with the solar panel. That means including the cords and any other accessory that may come with it. Something else to consider with the weight is durability. Especially with solar cells, a lower weight may mean less durability. This is especially true with thin film solar panels and they can be quite expensive to replace. The best portable solar panels will have the perfect balance between weight and durability. This is something that can vary depending on the type of solar panel you find. Many of the cheaper brands will only give you a 4- or 5-watt panel, which is fine for charging a small cell phone or mp3 player. However, most cell phones nowadays require more power to charge properly. In general, you will need at least a 7-watt panel. For larger electronic devices like a tablet or laptop especially, you will need an even higher wattage panel. For those, you will need at least a 15-watt panel. Basically, it all depends on what you plan on using the solar charger for. Be sure to check the wattage of the solar panel before buying. As mentioned before, there are three main types of solar panels. Each of them has their advantages and disadvantages such as price, durability, lifespan and many others. Ultimately, it comes down to you and what you need. 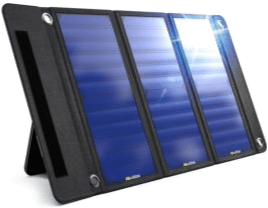 You get to decide what you think would be the best fit for you, this will help you choose the best portable solar panels. The first type of solar panel use the monocrystalline solar cells. These are the original silicon solar cells. The technology behind these panels originated back in the 1950s. The cells are cut from silicon ingots in a cylindrical fashion and each cell looks like a wafer, which gives these cells their characteristic look. Ten of the silicon wafers make up a monocrystalline panel. These panels were first introduced to the market in 1981. The major difference characteristically between mono and poly is that polycrystalline cells are rectangular instead of wafers. Raw silicon is poured into a square mold, which is then cooled and cut into perfectly square sections. These panels are also a shimmering blue which you might recognize if you know anyone with solar panels. In general, polycrystalline are the most popular types of solar panels. Thin film solar panels are interesting. These, unlike mono and polycrystalline, are not made with silicon. These panels use an alternative photovoltaic medius that are deposited in a thin layer over a substrate. Thin film solar panels are most often manufactured from cadmium telluride, amorphous silicon, copper indium gallium selenide, or organic photovoltaic cells. Easily damaged i.e. scratched, cracked, etc. 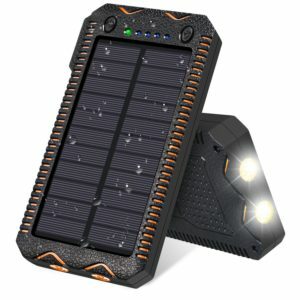 The best portable solar panels all have certain things included with them that make them so great over the others. 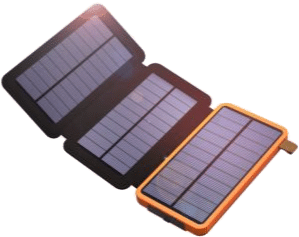 Here are all of the common features that you should look for when choosing the best portable solar panels. Solar Power Bank. It should be capable of charging your devices without sunlight. USB ports. A high amp port is also a good idea. High Capacity battery. Typically, 10,000 mAh or higher. People sure do have a lot of questions about portable solar power. Here are the top questions consumers have asked. 1. How can I get optimal charging performance? The answer is simple. All you need is direct, prolonged sunlight. The best time to use your portable solar panel is on bright, sunny days when there is not a lot of shade. 2. 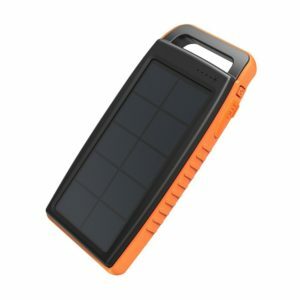 How long does it take to charge the battery in the solar charger? Ideally, in a 15000 mAh battery, it would take about two and a half hours to get from 0 percent to 50 percent. Really though, a 50 percent charge will give you plenty of power. 3. 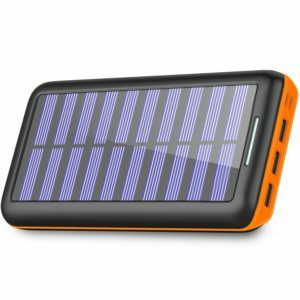 Can I leave the solar charger in direct sunlight for prolonged periods of time? Yes. Solar panels are designed to withstand extended exposure to direct sunlight. Simply avoid leaving it in areas where the temperature could reach extremely high levels. For example, do not leave it on the dashboard in your car. That completely depends on the solar charger. Certain ones are waterproof and others are not. Just to be safe, be sure to check with the brand that you are buying. 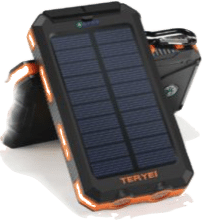 The main reason a portable solar panel is so cool is because you can charge your device anywhere without having to worry about finding a wall outlet. You can charge on the go, wherever in the world you are. Here are some articles that answer the most popular questions about solar panels. We have shown you our top 10 choices for the best portable solar panels. The features we have listed will help you to choose the best one for you, even if it is not one of the 10 on our list of favorites. However, be sure to read our individual reviews for each of the top 10. There, I will go over the advantages and disadvantages of each portable solar panel.